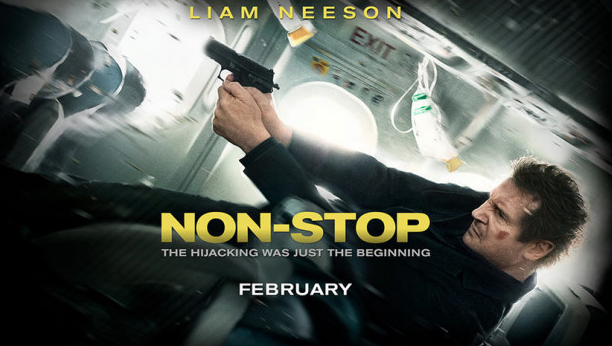 Neeson successfully shows that he is able to take his success from “Taken” (2008) and the “Batman” reboot and transfer it to other movies. After the previously mentioned blockbusters, Neeson’s gift for big-screen heroism is no more a secret than Rachel McAdams’ ability to charm an audience. Jen Summers, played by Julianne Moore effectively demonstrates her constant ability to play a variety of supporting roles. Never quite the leading lady, she is superb at selling her character to the audience. Often, I will see a movie just because she is in it. Part of this film’s success is due to the fact that the writers combine two movie devices in one plot. One is a take on the the locked room paradox: How is it possible to kill people on an airplane without giving away who you are? The second device was popularized by Angela Lansbury’s Jessica Fletcher in several episodes of the long-running murder-mystery series “Murder, She Wrote,” and novelist Agatha Christie’s “Murder on the Orient Express.” Obviously, those seeking iron-clad plausibility should look elsewhere, but “Non-Stop” does have its share of unanticipated sequences as well as Neeson’s forcefulness. The cinematographer, editor, and composer were all successful in making the audience feel trapped on the plane. Between the camera never leaving the confines of the fuselage while the game is afoot, and the editing and music adding to the pressure, the audience is able to feel as though they are being held hostage along with other the passengers and crew. If you’re looking for something to do this weekend, this is one movie you may want to check out!